In this lecture you will find detailed information on how to implement circle detection in C# with your camera application using the Ozeki Camera SDK. To achieve your aims, OZEKI Camera SDK has to be installed and a reference to OzekiSDK.dll has to be added to your Visual Studio project. The circle detection function can be used efficiently in several machine vision applications. The circle detection function is an important application for examining industrial parts or tools. Circle detection can be a very effective way to make your organizing and storage more easier. For example, in a warehouse where a million items can be found, circle detection can serve your purpose well. With the help of circle detection you can easily detect the circle-shaped items in smaller or larger areas. The ICircleDetector object of the SDK can be used for detecting circles. After an instance has been created with the help of the static ImageProcesserFactory class, we can detect on frames and on video as well. No actions are executed on the input frames they are simply forwarded by default. However, the object which implement the IImageProcesser interface (for example the ICircleDetector) can be added with the help of the AddProcesser() method. More instance can be added which implement IImageProcesser, they will run one after the other using the image which is before them in the list. The initialization of the global variables is the task of the Init() method. The instance of the FrameCapture mediahandler are set here and the ICircleDetector instance is also created here with the help of the ImageProcesserFactory. This also can be added to the ImageProcesserHandler instance. The processing of images is handled by the DetectionOccurred event of the ICircleDetector class to which we can subscribe here. This method fills the TextBox-es which can be found on the GUI with the actual settings of the ICircleDetector instance using the InvokeGUIThread() helper method. ShowImage: declares whether the original image should be shown or only the detected shapes should be seen with black backround. It is important if there are more image processer algorithm are running after each other. After all image/frame processing a DetectionOccurred event is popped up. In the arguments of this event you can find the list of detected circles where the centers/radius and area of the circles can be queried. Coming later in the second half of January 2015. Based on the information that you can find on this webpage you will be able to efficiently implement the circle detection function with your C# camera application using the Ozeki Camera SDK. Is there a maximum of circles that can be detected with the help of the circle detection function of the Ozeki Camera SDK? No, there is no limit. 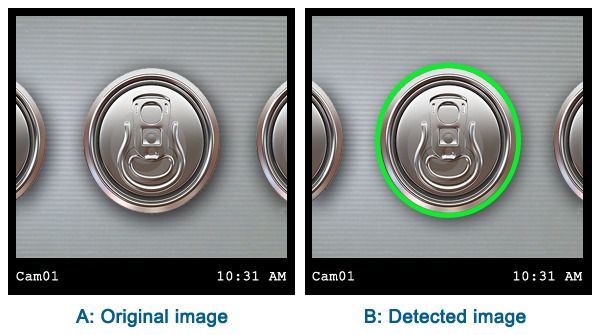 You can detect all circles with one function using the Ozeki Camera SDK. Am I able to detect an exact amount of circles? For istance, can I filter which size of circle would I like to detect? Yes, you are able to detect only those circles of which you provided the size previously.